Russian and British foreign ministers Hague and Lavrov agree to stand behind Kofi Annan’s peace plan for Syria but disagree over who is to blame for the violence. Government forces and rebels share the blame for this weekend’s massacre in the Syrian town of Houla, according to Russian foreign minister Sergei Lavrov. 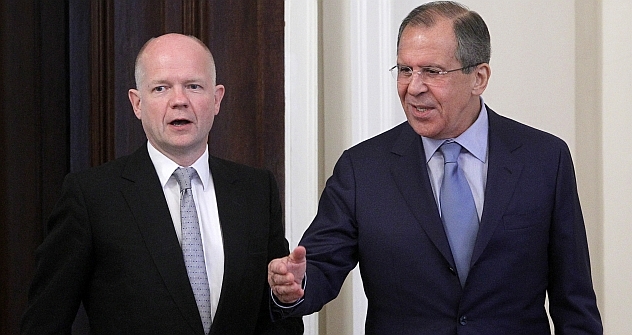 Testimony by United Nations observers indicated that both the authorities and the insurgents “were to blame for the deaths of innocent civilians,” Mr Lavrov said after talks with his British counterpart William Hague in Moscow on Monday. Lavrov also said “dozens of players” were involved in the current violence. At least 108 people, around a third of them children, were killed in the town of Houla, near the former rebel stronghold city of Homs at the weekend, according to UN observers. The UN Security Council, of which Russia is a permanent, veto-wielding member, unanimously condemned the Syrian authorities on Sunday for the “outrageous” attack. Russian deputy UN ambassador Alexander Pankin told journalists that Moscow did not rule out that the killings in Houla were a “provocation” carried out by rebel forces ahead of the planned visit by UN peace envoy Kofi Annan to Syria on Tuesday. He also refused to rule out the participation of foreign special forces in the attack. The Kremlin has opposed attempts to impose UN sanctions on Syria, an ally where Russia maintains its only foreign military base, over what western powers say is the brutal suppression of an uprising against President Bashar al-Assad. Moscow, which continues to arm Damascus, says proposed UN resolutions on the violence-stricken country are biased in favour of the rebels. But Russia has given its full backing to UN envoy Kofi Annan’s faltering six-point peace plan for Syria, and Lavrov reiterated on Monday that Damascus must show more decisiveness to end the violence. The British Foreign Secretary said the UK accepted that rebel forces bore responsibility for some of the violence. “We are not arguing that all of the violence in Syria is the responsibility of the Assad regime, although it has the primary responsibility for such violence,” Mr Hague said. Both Hague and Lavrov insisted that Mr Annan’s peace plan was the only way forward. “We are very much agreed that the Annan plan is the best hope for Syria,” Hague said, adding that the alternatives were ever-increasing chaos in Syria, and a descent towards all-out civil war. Lavrov said that Russia was applying pressure “daily” on Syria, but that it believed certain other countries were not fully committed to Annan’s plan. Moscow has condemned western suggestions that regime change in Syria is the solution to the spiral of violence, and Mr Hague was keen to emphasise on Monday that President Assad’s immediate fate was not the main concern. Hague and Lavrov’s talks came as Syrian opposition activists alleged that more than 30 people, including women and children, had been killed in the central city of Hama on Sunday by government shelling. More than 9,000 people have been killed in clashes between the government and opposition forces in Syria since the uprising against Assad began in March 2011, according to UN estimates.